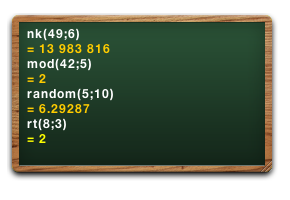 If your number crunching needs more space, grab the widget’s resizer and stretch it to whatever dimensions you wish. Easily change font family and size in the new settings panel. 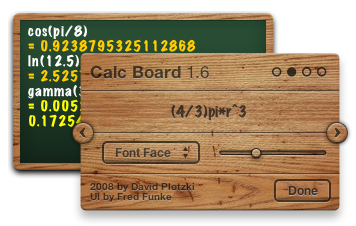 Calc Board features a new icon in its dock which lets you save your protocol to the desktop. Got entangled in cryptic syntax? The new help command lets you instantly search the manual. Take some chances! 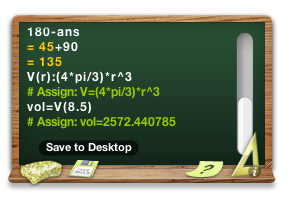 We tought Calc Board the stochastics you need: calculate binomial coefficients and distributions, permutations, combinations, and variations. We added modulo, fraction and truncate, improved the random function to accept any old range, rearranged the rt-parameters for far better convenience and made the gamma function way more precise. Back to the Calc Board Home Page.